Most already know that federal laws dictate that qualified retirement plans be written and communicated clearly and efficiently to employees. However, what happens if and when employers decide that they want to change their plans’ provisions? To do so, they must make amendments to their plans (these can sometimes be partial amendments or an entire rewrite of the plan). When the plan is rewritten completely, it is called a “restatement.” Restatements usually occur every 5-6 years, depending on the employer and the details of his or her plan. There are also cases in which plan restatements are mandatory. When this happens, we receive an alert from the IRS, and then notify our clients. 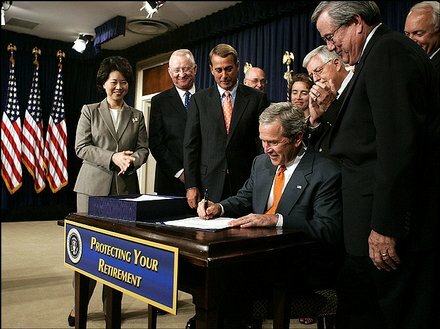 George W. Bush signs the Pension Protection Act into law on August 17, 2006. When it comes time to amend a plan, the IRS grants a two-year window of time that employers have to make the necessary changes. In the early days of the restatement requirement, the IRS allowed for long periods of time between the time of a change in the law and the time a plan needed to be updated. However, the IRS decided to shorten the delays in order to encourage greater compliance with the law. The deadline for this particular restatement window is April 2016. If you don’t adopt an amendment or restatement on a timely basis, you are a late amender or a nonamender, which means your 401 (k) plan doesn’t comply with current regulations and is no longer a tax-favored qualified plan. The consequence for this could be plan disqualification and loss of tax benefits. The IRS offers a “Fix-It Guide” detailing mistakes and errors that companies make with their 401 (k) plans, and how to find solutions to the errors. According to the guide, one of the most common mistakes is failing to update a plan document so that it accurately reflects recent law changes, like the PPA Restatement. If you find that you missed the deadline to adopt an amendment or restatement, you may need to use the IRS correction program, as well as pay a penalty to the IRS. Although the PPA restatement can sometimes be tedious and complex, it may help to remember that it does have its rewards, namely the result of an updated, compliant plan which provides necessary retirement income for your employees and for you as well. It also protects against fraud and abuse. Stay tuned for our “PPA FAQs” Guide, coming soon to the blog! Previous Previous post: How Prepared are Small Business Owners for Retirement?